I don't know about the rest of you, but this week has passed by in a total blur. It was my eldests first week of Kindergarten at her new school, and it's been quite the adjustment for everyone. So a smallish update for you this week, but there are a lot of sock sets and other goodies to be had! Just a reminder, the clearance sale on my discontinued bases continues. Crystal is 20% off with the code "CrystalClear"
Tachyon is also 20% off with the code "Tachyon"
First of the colors I have for you this week is Eta Carinae. 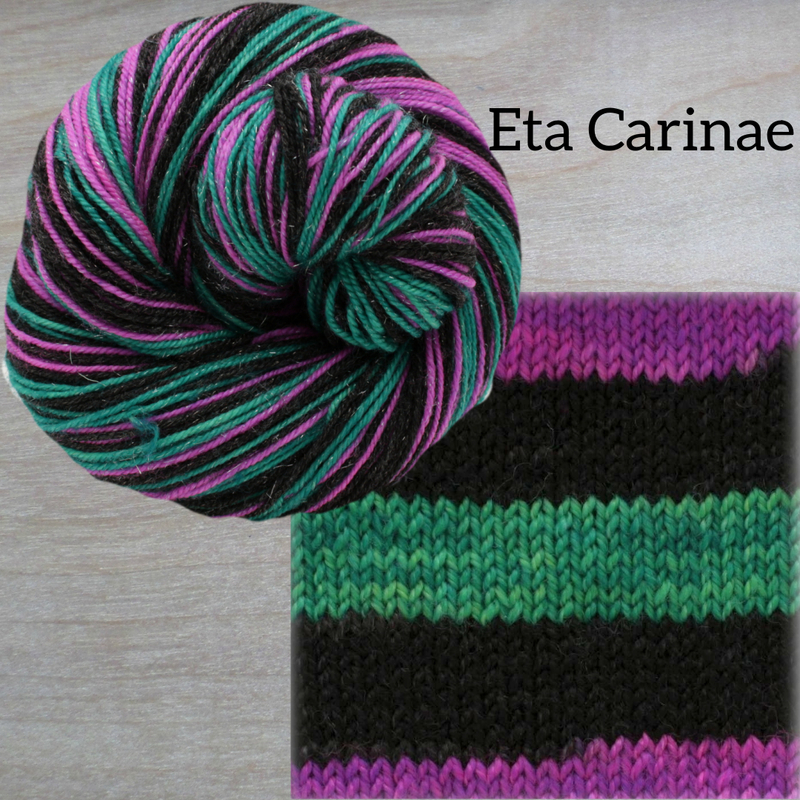 This one is an even stripey with 6-7 rows each black, emerald, black, and purple pop. Eta Carinae, formerly known as Eta Argus, is a stellar system containing at least two stars with a combined luminosity greater than five million times that of the Sun, located around 7,500 light-years distant in the constellation Carina. You can see single skeins of this colorway here. 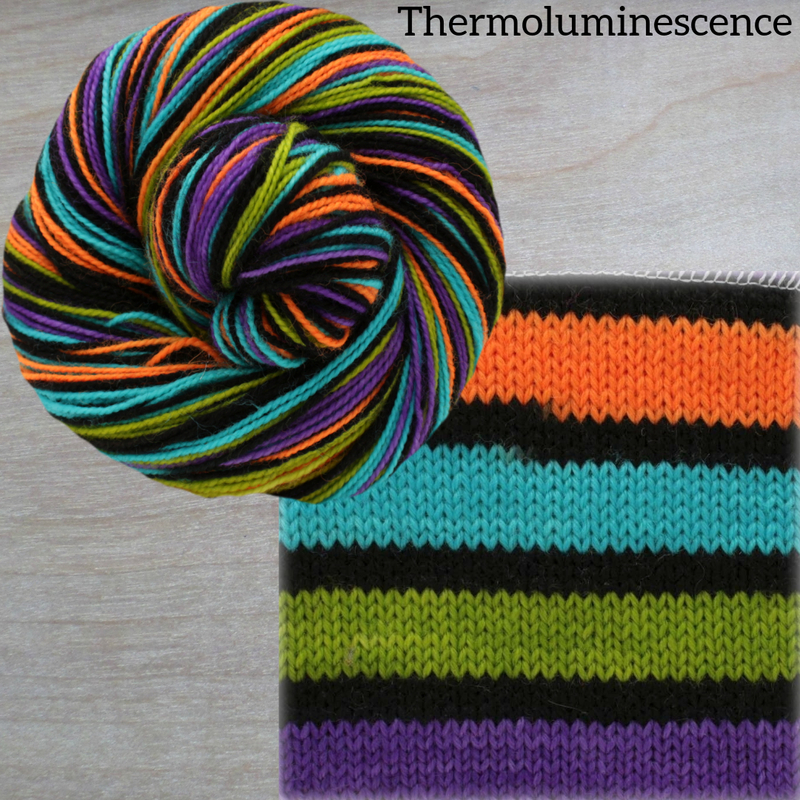 Thermoluminescence is a complex stripey with 6-7 rows each fluorsecent orange, aqua, true chartruese and electric violet divided by 3 rows of black. Thermoluminescence the property of some materials that have accumulated energy over a long period of becoming luminescent when pretreated and subjected to high temperatures, used as a means of dating ancient ceramics and other artifacts. Projects on Ravelry are here. 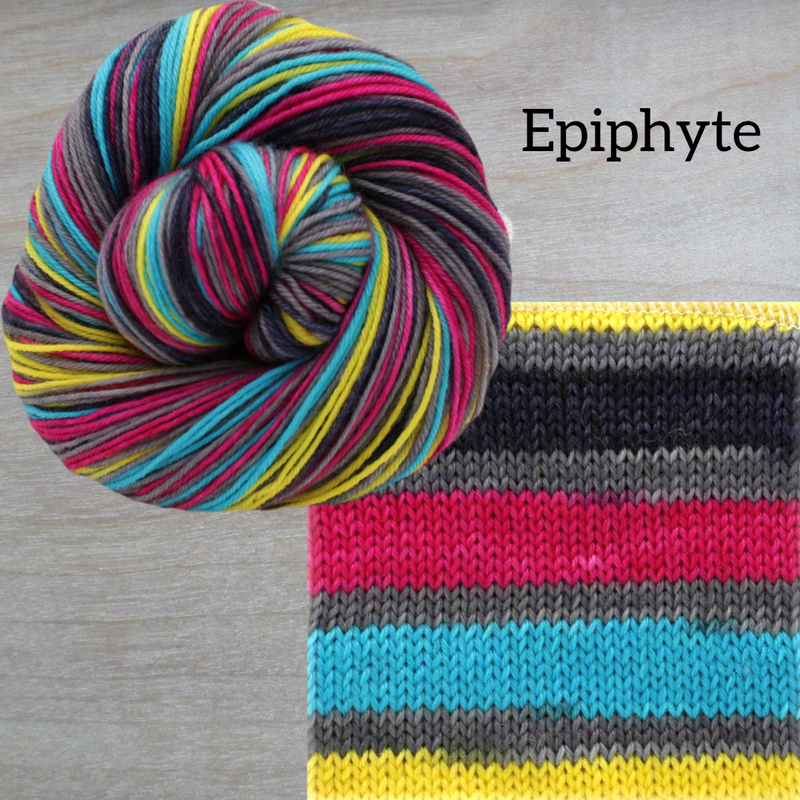 Finally this week is Epiphyte, another complex stripey. This one has 6-7 rows navy, magenta, caribbean blue, and sunshine yellow divided by three rows of grey. An Epiphyte is a plant that grows on another plant but is not parasitic, such as the numerous ferns, bromeliads, air plants, and orchids growing on tree trunks in tropical rainforests. If you remeber from the last shop update, I recommended two new patterns, Sock Arms and Little Sock Arms. Well, we're having a KAL in my group on Ravelry! You can join us on Ravelry right here.